So, Day 1 of the Euro City Cycle experience is coming to an end (or Day 2 has started depending on whether you’ve re-set your clock to Central European Time) and we’re all settling in to life on the open sea for the next few hours. As we rest (hopefully sleep!) the ferry will take us from Harwich to the Hook of Holland, where our adventure will continue. Day 1 saw us ride from Brentwood to Harwich, 65 – 70 miles (depending on how many times and how badly you got lost) into our journey. We have had a day cycling along meandering lanes through, picturesque villages, on our way to the coast. It wasn’t the longest day ever in terms of physical miles travelled, but it’s seen a big step forward many of the participants; Introductions have been made, general nerves have been laid to rest, cycling groups have been formed (based primarily on pace)… we’re under way. For some people there are still many questions to be answered: Will the ferry make me ill? Which cycling group suits me best? How do I work these brakes? I haven’t spotted the berk yet, does that mean it’s me? Have I made a huge mistake? These will be answered as our journey unfolds. The weather held out during the day with only a few spots of rain. As a result, there were some pink faces this evening (including my own) where the sun and the breeze had worked their combined magic. Much more rain is forecast… it could dampen our spirits as we hit the continent. For me, any concerns about general fitness are gone. I was comfortable today, the training has been worth it! There is still a question about the cumulative effort over the four days, but I’m trying to pace myself (both on and off the bike) to give myself every chance of a successful outcome. If this means I need to be selfish and just look after myself from time to time then that’s how it has to be. Tomorrow we head to Amsterdam and a whole new set of challenges… wish us luck! The view from just up the road from the Holiday Inn, Brentwood. Definitive proof that Brentwood counts as “London”. This entry was posted in Charity Bike Ride and tagged Brentwood to Harwich, Charity Cycle, Cycling, Euro City Cycle on May 8, 2014 by Paul Squire. Thanks Jill! Just about to head in to Amsterdam. Cycling for Day 2 almost complete! 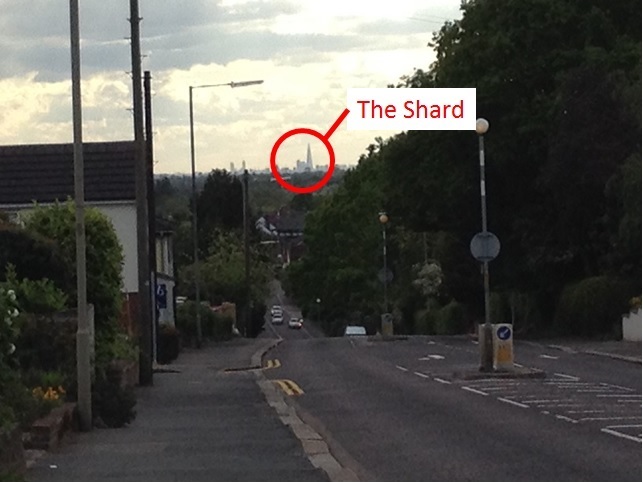 That’s not the Shard…it’s the Loch Ness monster. 🙂 Not far from it!